The US President Donald Trump might be happy to know that Indian IT companies have cut the number of H1B visa applications for their employees this season, as reported in today’s edition of The Economic Times (dated April 3, 2018). Instead, major Indian IT conglomerates are eyeing on creating jobs in the United States, hiring fresh engineering, technology or science majors from reputed US colleges and serving their US clients better than the best. Bengaluru-based Wipro Limited, one of the Indian tech giants in information technology, has announced to create hundreds of jobs at its upcoming facility in the US state of Texas. It followed Infosys’ recent press release which publicized Infosys’ plan to set up a $21-million technology and innovation hub in Hartford, the capital of Connecticut and create over 1000 jobs there. 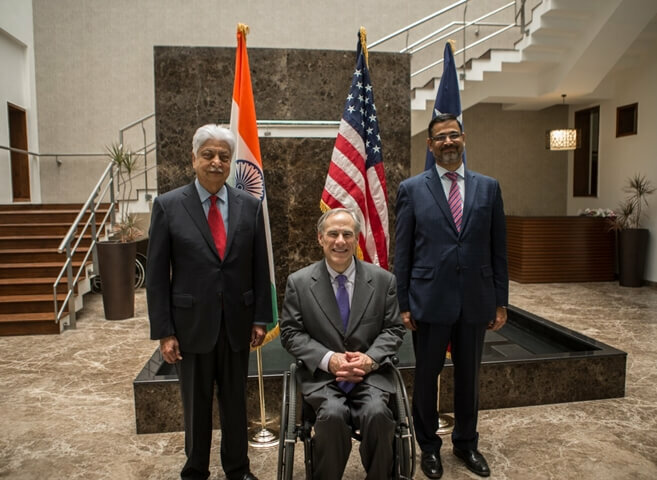 The announcement of Wipro Limited’s upcoming Texas Technology Center in Plano was made during Texas Governor Greg Abbott’s most recent business trip to India. Greg Abbott, who celebrated Diwali 2017 with Indian Americans at his mansion in Austin, visited the headquarters of Wipro in Bengaluru during his 9-day trade mission to India. He described Wipro as “one of the premier technology companies on the globe” and offered to help Wipro expand its operations in the Lone Star State, Texas. The upcoming Wipro Technology Center in Plano, TX which will serve as Wipro’s IS Cyber security and advanced analytics hub, will initially provide employment to 150 engineering, technology and science graduates in the US. The Wipro Technology Center in Plano will focus on developing new capabilities in such emerging technologies as artificial intelligence for its US clients. Dallas and Houston in Texas are among the locations of Wipro’s 200 offices and facilities outside of India. Wipro Limited is planning to increase the number of its employee headcount in Texas from 1400 to 2000 in the coming years, according to the report of Texas Governor Greg Abbott’s trade delegation to India. The new jobs at Wipro Technology Center in Plano will pay an annual salary of $70,000 to $100k. “Having over 1400 employees at its facilities in Dallas, Houston and Plano, Wipro is playing a vital role in the growth of Texas economy. From investing in the socio-economic landscape of Texas to providing for the Hurricane Harvey relief work, Wipro has become a valued leader in the evolution of Texas. I thank Wipro for investing in the future of the Lone Star State,” said Greg Abbott. 120 of the 150 positions at the initial phase of Wipro Technology Center in Plano have been filled. A little more than half are fresh American graduates from the local institutions including the University of Texas, and the rest of the workforce will be sourced from India, according to Abidali Z. “Abid” Neemuchwala, Texas-based Chief Executive Officer and Executive Director of Wipro Limited. The new hirees will be given on-the-job training for 6 months at the upcoming facility in Plano. Not only Wipro Limited but also JSW Group, another Indian conglomerate headquartered in Mumbai announced to create 500 jobs at steel plant in Baytown in Harris County, Texas during Greg Abbott’s delegation in India. India’s largest steel producer, JSW Group will reportedly make an investment of $500 million to upgrade the steel plant. The Texas Governor visited both Wipro headquarters in Bengaluru and JSW Group headquarters in Mumbai City. Hello how do I apply. I’m USA citizen and willing to move to Texas.